Been thinking about the whole floating initiative idea some more. I've talked previously about adding a unit's current IN to their LD when rolling tests. But looking at this chart makes me think that we could just go with a version of our original LD/Nerve split. 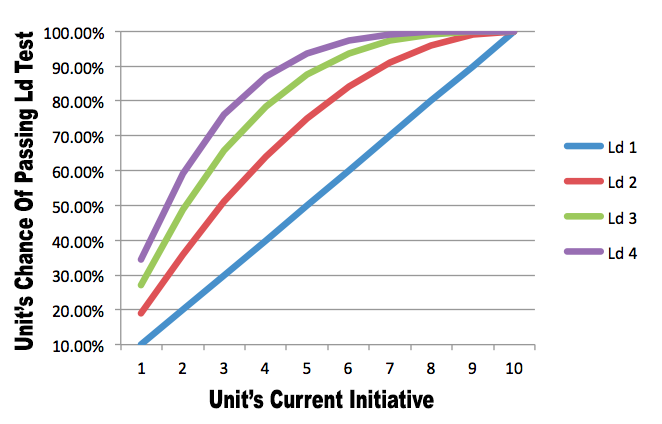 Where Nerve is replaced by a unit's current initiative, and LD just determines how many dice you get to roll to try and have at least one come up equal to or less than the current initiative. A LD 2 unit going into the game with IN 5 would (if required to test) have a 75% chance of passing a LD test. If they fall to IN 1, they still have almost a 1-in-5 chance of passing, assuming that they haven't lost their leader. I'm thinking that 2 LD dice would be the standard. Add a third die for officers, and maybe a 4th for extra special something or others. Do it that way and we don't need an explicit LD characteristic in the stat line.